The biggest ever bombing campaign by US B-52 aircraft took place over Christmas 40 years ago, when the US dropped at least 20,000 tonnes of explosives on North Vietnam, mostly Hanoi. More than 1,000 Vietnamese died, but some claim the assault may have helped bring about the deal signed a month later that led to an end to US involvement in the war. Operation Linebacker II was President Richard Nixon's attempt to hasten the end of the Vietnam War, as the growing strength of the Viet Cong caused heavy casualties among US ground troops. The capture and torture of downed airmen in the north, regularly paraded on television, was also an embarrassment for Washington. Nixon was under pressure to bring the troops home. At the same time, long-running negotiations in Paris between the warring parties had broken down. The relationship between American negotiator Henry Kissinger and the government in the south was strained, while Le Duc Tho - representing the northern Communist government - was refusing to budge on the issue of prisoner releases. So the Americans decided to take decisive action. On the evening of 18 December, 129 B-52s roared over Hanoi - huge bombers each capable of carrying many tonnes of explosives. They flew in formation, in successive waves made up of smaller cells, containing three planes. Thousands of metres below them, the sirens sounded and residents of Hanoi raced for the shelters. Among them was Ha Mi, who was 10 years old at the time and remembers sheltering under the stairs of her family home with her sister, listening to the bombers overhead. "You can hear them coming from very far away," she remembers. "Advancing, they are looming, coming towards you with a very low hum. It's frightening." The Americans had been using fighter jets over Hanoi for years, targeting fuel depots and munitions stores, but Ha Mi recalls it was the B-52s, and their massive payloads of bombs, that struck terror into Vietnamese hearts. "The fighter jets were faster and would only drop one or two bombs, then they were gone," says Ha Mi, who works as a journalist for the BBC Vietnamese Service. "The B-52s were slower... and the bombing is more regular. Boom, boom, boom, for a longer period of time. It's more threatening,"
The bombing was suspended on Christmas Day, but during the days either side, the US Air Force flew 729 night-time sorties over North Vietnam with devastating effect. Later, Kissinger would describe the communists as being "on their knees" as a result. But it was a dangerous mission for the American airmen. The North Vietnamese had sophisticated Soviet-made surface-to-air missiles or SAMs, and plentiful supplies of anti-aircraft artillery. They also had a number of Soviet MiG-21 fighter jets. The lull on Christmas Day gave the Vietnamese a chance to regroup. When bombing resumed on 26 December, they put up strong resistance. A rare recording of the radio communications inside one of the US B-52s survives from that night. One airman can be heard saying, "I've never seen so much triple A [Anti-aircraft artillery] in my life." Another comments: "Those SAMs came right up past my window, they were damn close." In just one night, more than 2,000 homes were destroyed around Kham Thien, a busy shopping street in Hanoi. About 280 people were killed and at least as many again injured. Ha Mi had a friend, whose house was hit. "There were a few houses still standing, but most of it was just rubble, flattened on the ground - or even just a big hole. Houses were just gone, it was horrible. I remember seeing people just standing there looking at it - but there was nothing there. Everything was just gone." The US Air Force lost two B-52s that night out of a total of 15. A number of fighter jets and support aircraft were also destroyed during the 11 days of Linebacker II. At least 30 US airmen were killed and more than 20 went missing in action, others were captured after ejecting over North Vietnam. 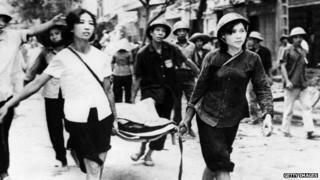 At the time the communist authorities said about 1,600 Vietnamese were killed, but many suspect the true figure is far higher. Linebacker II came to an end on 29 December and by 8 January all parties were back in the negotiating room in Paris. The Paris Peace Accords were signed by the end of the month, leading to the release of some US prisoners of war and paving the way for an end to US military involvement in Vietnam. Rebecca Kesby's interview with Ha Mi will be broadcast on 26 December on the BBC World Service's Witness programme. You can download a podcast of the programme or browse the archive.